In 2006, when we were preparing for our first cape buffalo bowhunt, we did extensive testing for the perfect bow/arrow/broadhead combination. We determined that the optimum setup for cape buffalo was an extremely heavy bow, an extremely heavy arrow, and a 2 blade heavy broadhead. Despite two unsuccessful hunts in 06 and 07, that setup remained identical for my 3rd buffalo attempt in 2009. This time, however, I was successful and my equipment worked as I had hoped. As we were waiting for the trackers to bring an Argo back to the kill scene we decided to follow up our penetration test with a unique, real-world test on a fresh cape buffalo carcass! In addition to the Penetration shots, we also did a forensic analysis on the kill shot, and forensic analysis on the subsequent penetration tests to determine the extent of damage and penetration experienced based on four shot scenarios on a cape buffalo. Penetration 1 - The actual Killing Shot on the buffalo. 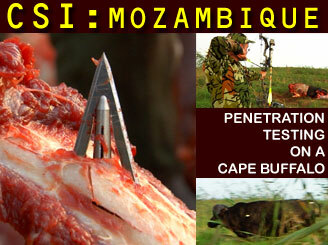 Please Read - We are not testing a variety of broadheads, broadhead styles, arrows or bows. We are testing the equipment we had chosen for this bowhunt in order to validate our original theory and to see how well that equipment performed under a variety of shot scenarios on a fresh cape buffalo. Since a cape buffalo is close to 2000 lbs and possesses a muscular and skeletal structure far heavier than any North American animal, we can conclude that any successful penetration on the buffalo will be more than adequate for the largest North American Animal, as well as all african antelopes.